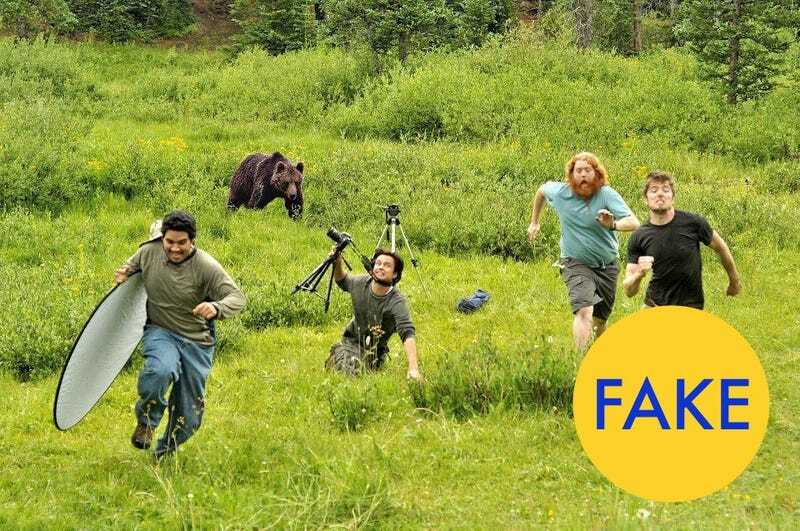 Behind the scenes of "behind the scenes at National Geographic"
Have you seen that "behind the scenes at National Geographic" photo where those guys are running from a bear? It's pretty amusing. But it's a fake. Super duper, 100 percent fake. So where did it come from? After I debunked the photo in my latest FAKES round-up, Tim Sparks, a filmmaker in Colorado, contacted me about the image through Twitter. He's the bearded redhead in the photo and says that the picture was made back in 2011. Sparks and the other guys in the photo were doing some location scouting in Salida, Colorado for a film that never wound up being produced. "All of our friends and family knew we were out in the wilderness location scouting so we thought it would be funny to create a photo of us running from a bear and post it on Facebook," Sparks told me through email. "A few of us posted it and we all had a good laugh with our family and friends." Below, the original image before the bear was added. After they first posted it to Facebook, it slowly but surely started to spread to other sites. And that's when it began to mutate. The caption would morph, sometimes subtly, as so many viral photos tend to do. Once Reddit got ahold of it, the image couldn't be stopped. It started showing up with headlines like "Wildlife photography gone wrong," and "Behind the scenes of National Geographic." Naturally, it got meme-ified with versions like "Godzilla photography gone wrong." So who are the rest of these guys from? The guy on the far right is Nathan Phelps of Warcell Productions. The man holding the camera in the center is Teodor Vladimirov, who also happened to be the photoshop wizard who added the bear. Mario Martinez is on the far left and actor Brandon Smith took the photo. As for the bear? Well, that's a stock photo, of course. The group tried different versions of the shot, but obviously they chose the right one. Because people can't seem to get enough of their creation. Seriously, it's everywhere. Hey look, it just got posted to Reddit again today. Now that people definitely know the image is a fake, will it finally die a natural death? Probably not. Never underestimate the internet's ability to recycle a hoax-y joke for eternity. In fact, this photo will likely outlive us all. Factually is Gizmodo's blog of fun facts, debunkings, and weird trivia. Join us on Twitter and Facebook.